Update: The 2012 Back to School Give-Away is closed. Thank you for participating. See winner here. Update: OnTimeSupplies.com teamed up with Avery to make the Back to School Give-Away bigger & better than ever! 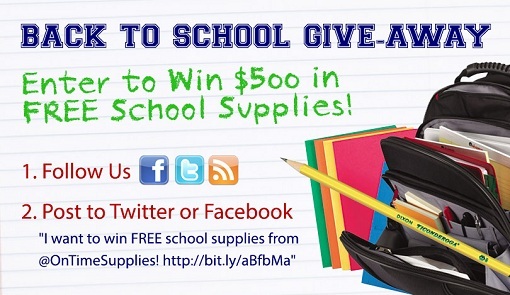 Now you can win $500 in FREE school supplies! We’re giving away tons of great Avery office products that help you stay organized all year. Plus, everything your kids will need this school year and next — Crayola markers, Mead notebooks, Ticonderoga pencils and so much more. You can can also enter the drawing here on the blog. 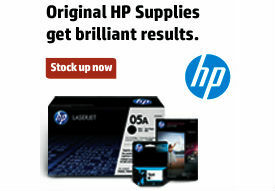 Just subscribe to Office Ink and paste “I want to win FREE school supplies from @OnTimeSupplies! http://bit.ly/aBfbMa” in the comments of this post. Up your odds of winning for by following and posting on Facebook and Twitter. That nets you three contest entries. For a complete list of all the prize, plus all the rules, head on over to contest page at OnTimeSupplies.com. Good luck!